Thermal Solar Power is a type of solar power system that uses special solar panels which use sunlight to warm up water or a heat transfer fluid that flows through the panels, so that the energy can be used for domestic plumbing use or for heating a swimming pool. In a 'pump-circulated' Thermal Solar Power system, a storage tank is mounted on the ground or floor, and is below the level of the collector panels which are typically mounted on the roof; and a circulating pump moves water or heat transfer fluid between the tank and the collectors. In a 'close-coupled' Thermal Solar Power system, the storage tank is horizontally mounted immediately above the solar collectors on the roof, and no pumping is required, as the hot water naturally rises into the tank through thermosiphon flow. If your solar power system is the type that makes electricity instead of hot water, then you should instead mark the checkbox for Solar Power (photovoltaic). Shown in the 'Routine Care' section are the recommended routine maintenance tasks for your solar power (thermal). The 'Q & A' section shows answers to common questions. 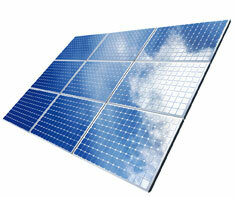 And the 'Articles' section provides helpful articles about your solar power (thermal).